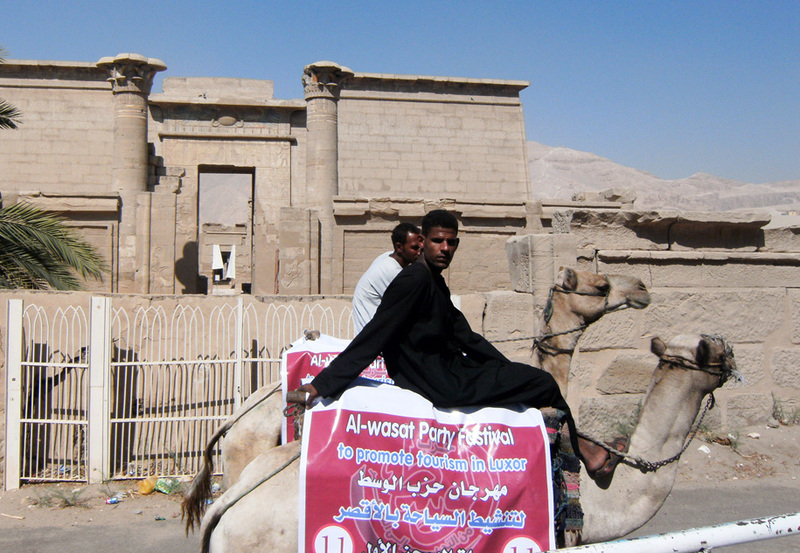 A political party’s office in Luxor which is headed by a tour guide/businessman decided to make the best of the fact that Luxor is depending mainly on tourism and thousands of the voters in the next elections, in few months, in the governorate are working in the industry to promote for their party and win people by showing that they are on their side even though what they do is only for show. 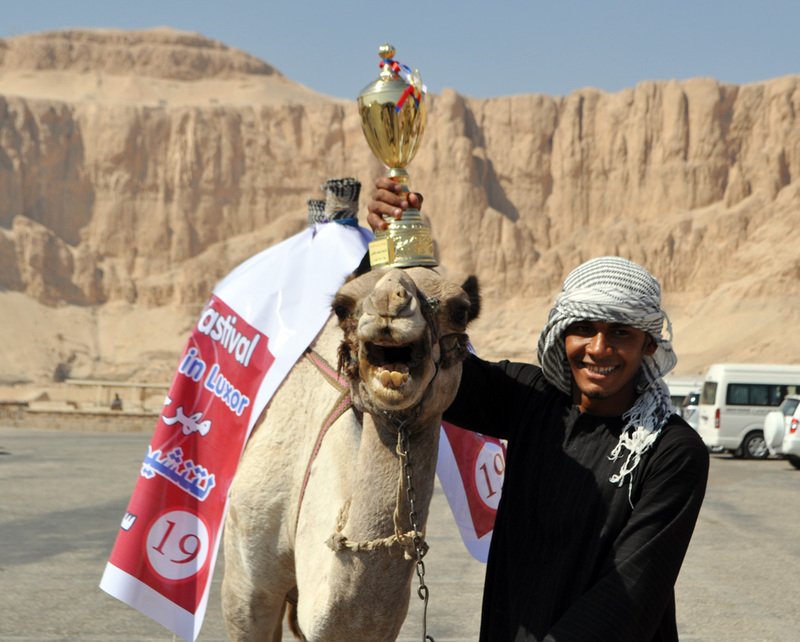 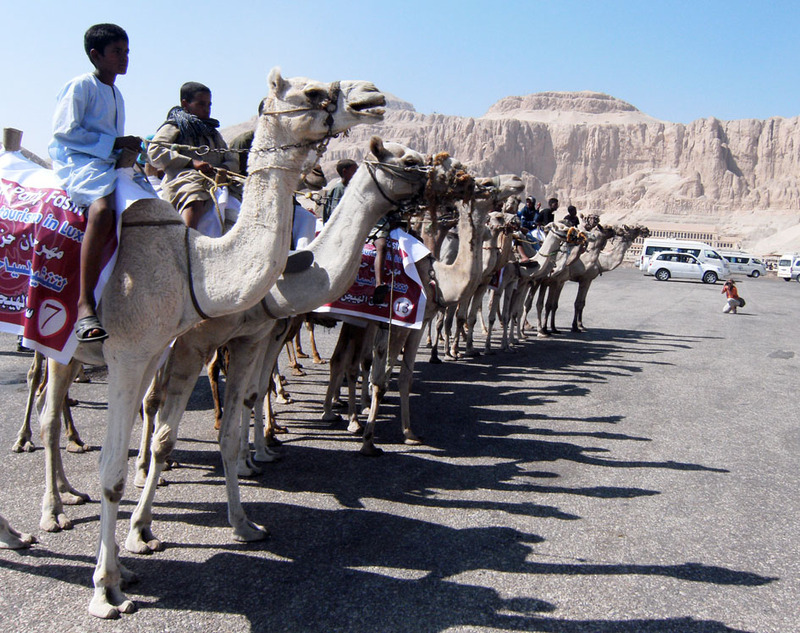 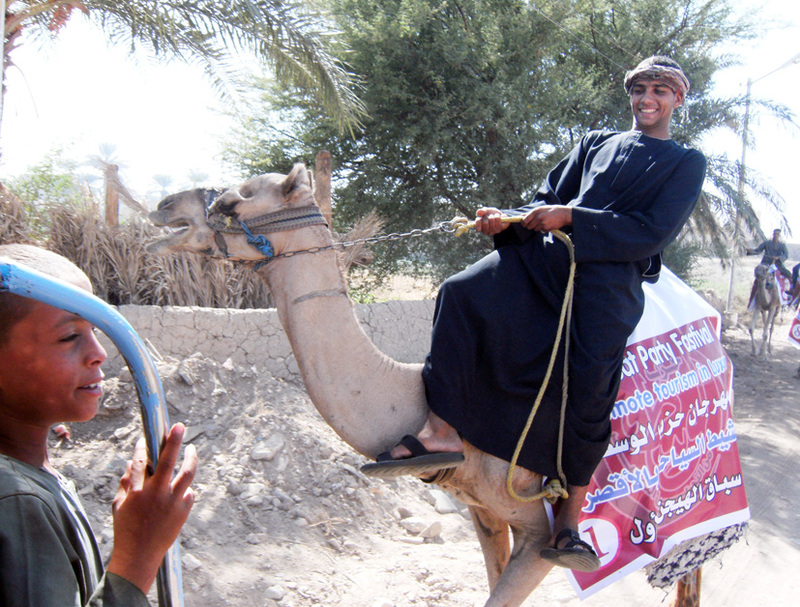 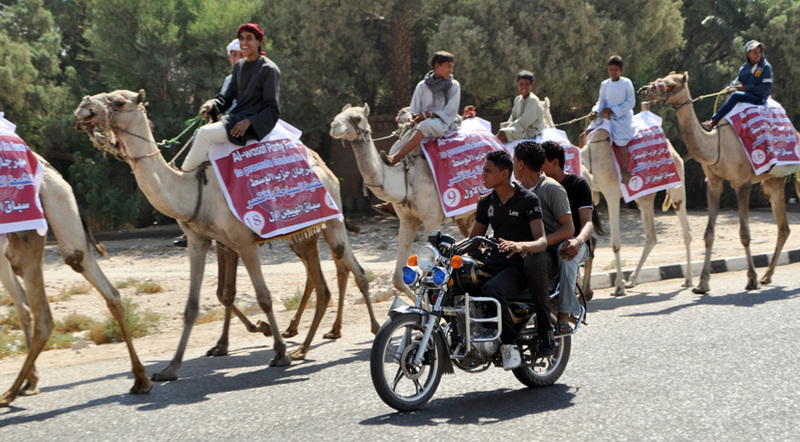 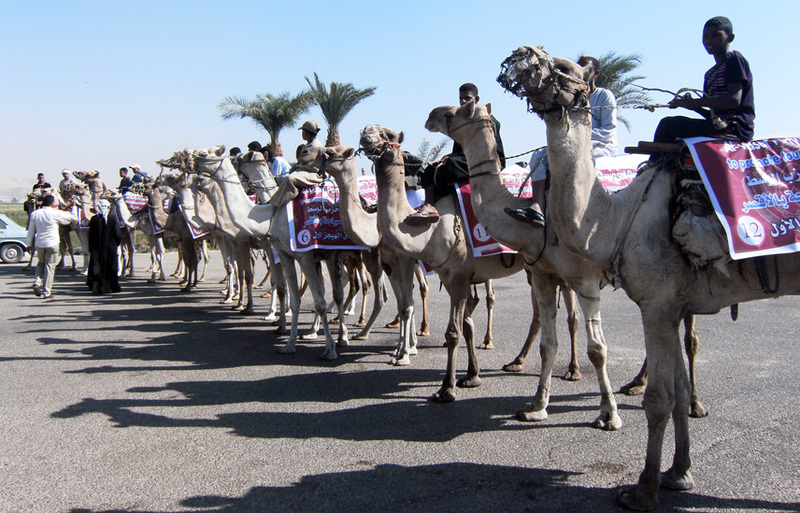 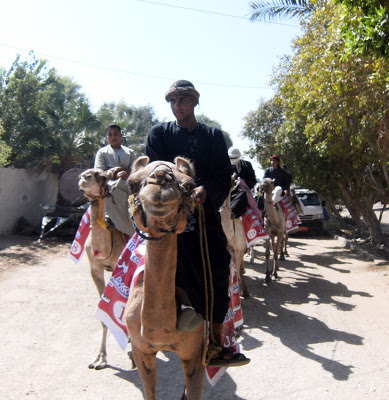 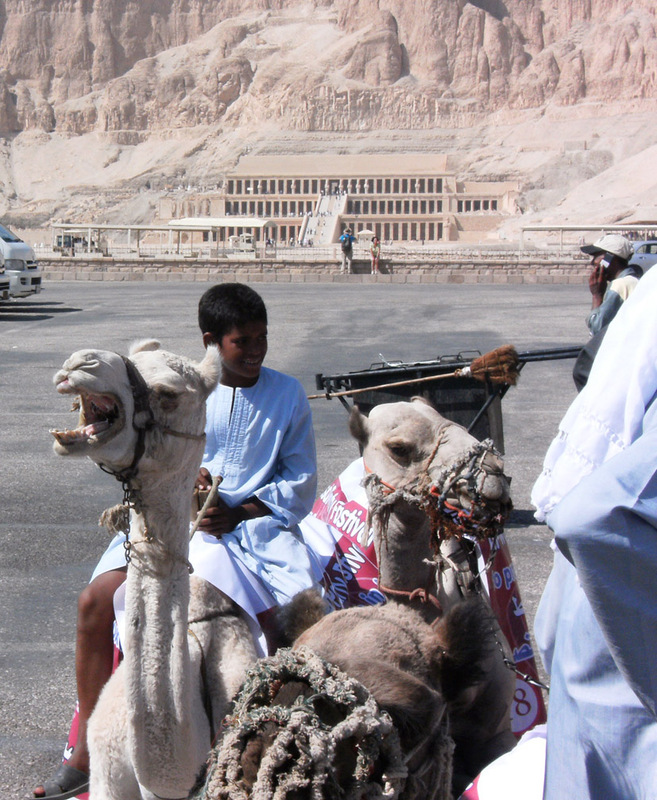 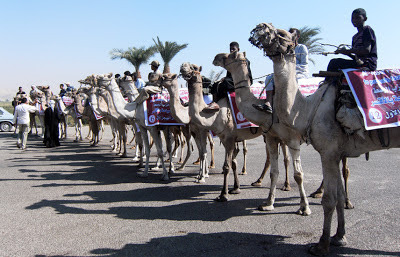 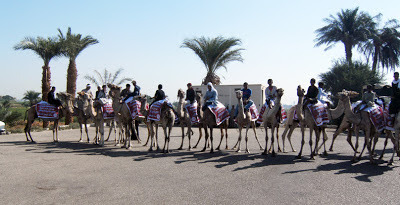 Anyway, we are not talking politics here, Luxor Times magazine covered the event and you can enjoy the video and photos of the “Camel Race”. 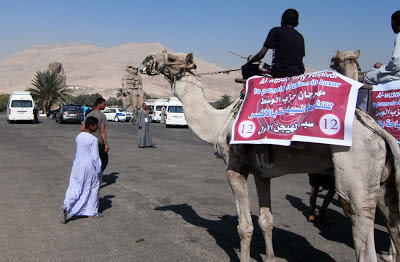 Below the pictures, there is the full story of how the day was like. 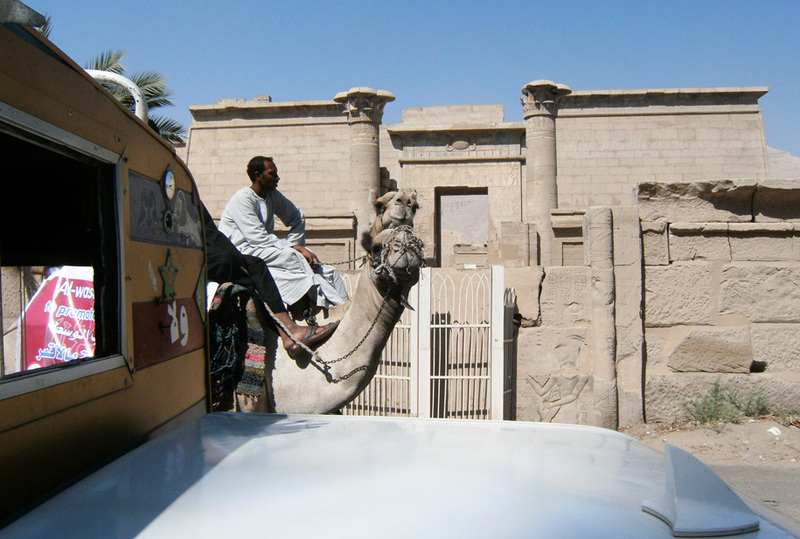 Above: The Camel kissing one of the colossus. 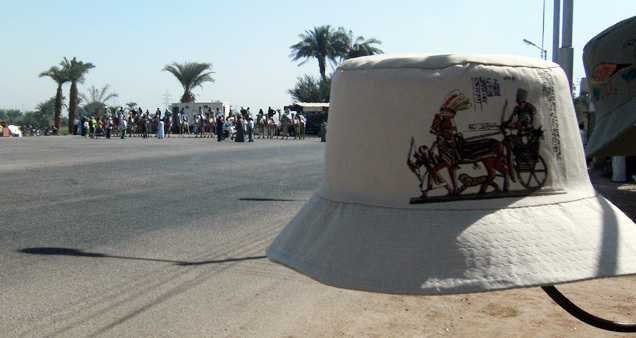 Below: Ramses II on his chariot printed on a hat in a shop nearby overlooking the camels getting ready for the "Race"
The Winner with his trophy and chanting "We are the Champions"
The race which was supposed to start at 9:30am but of course no one was there on that time beside few party members who didn’t know when the camels are supposed to be there or the race starting time. At 10:15 the party vice president and officials arrived and wanted to take pictures with the few foreigners who were there to show that they support tourism and don’t have any concerns against dress code or so. 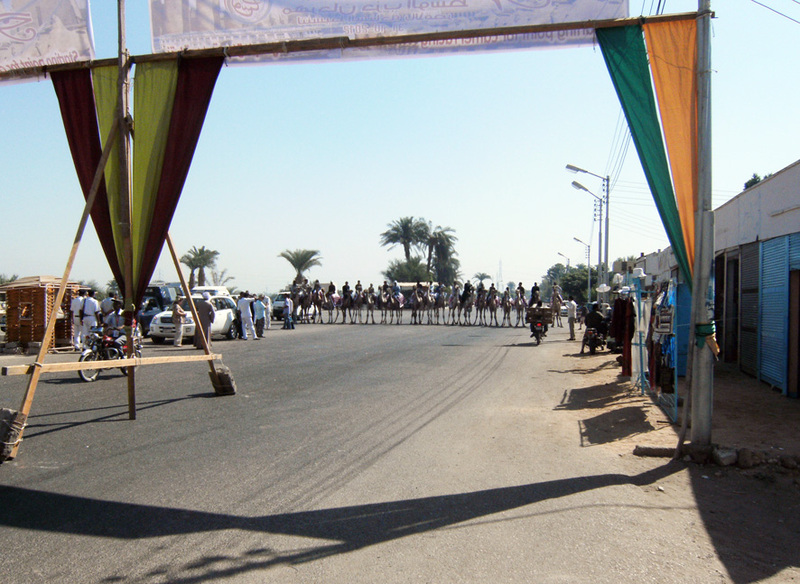 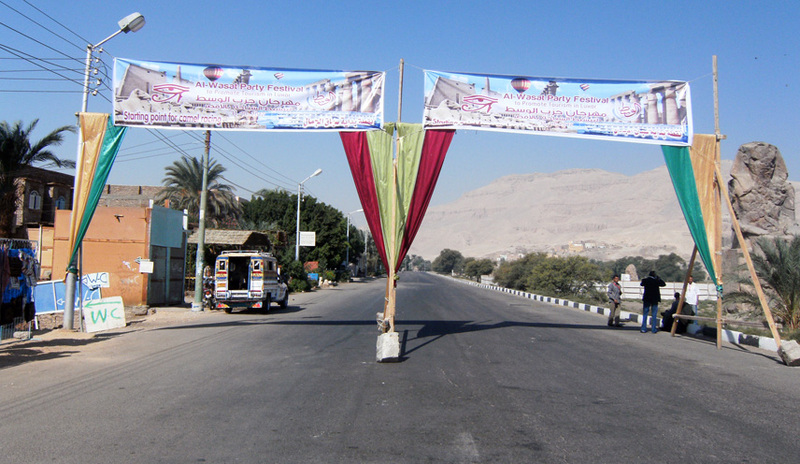 Yet, the race couldn’t start because they were waiting for the local media to arrive, after all this “Tourism Festival” (or Fastival as it was spelled on the camels banners) was organised for the media mainly). 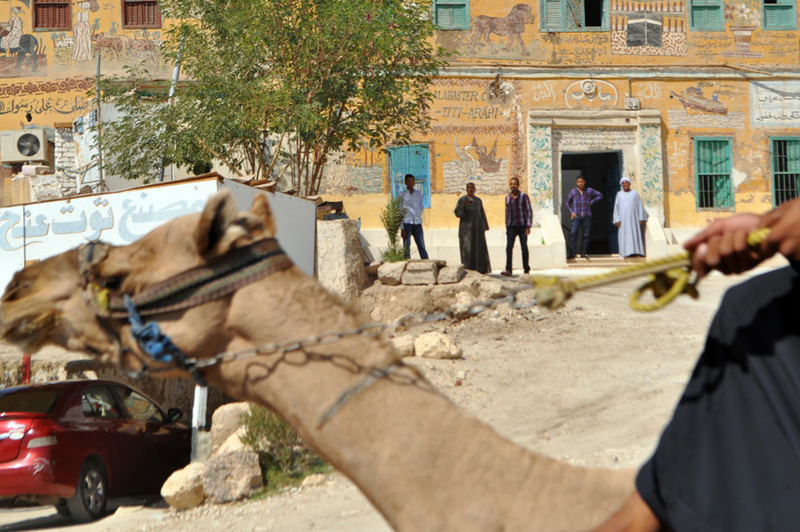 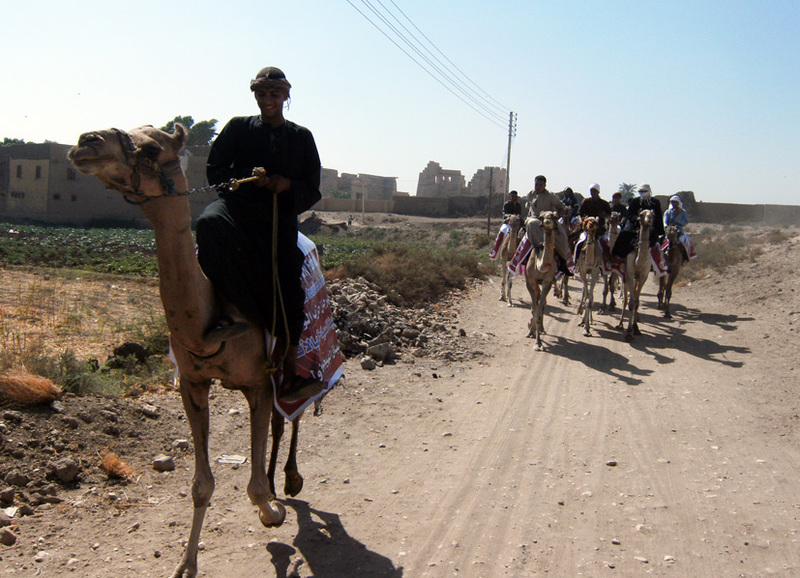 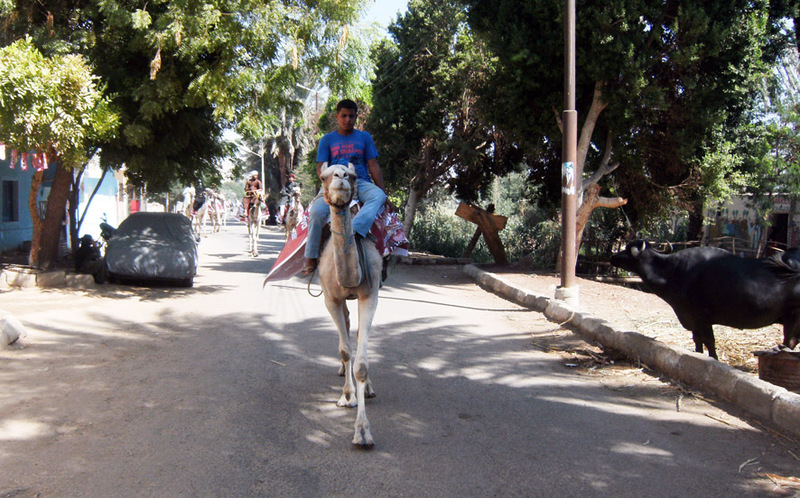 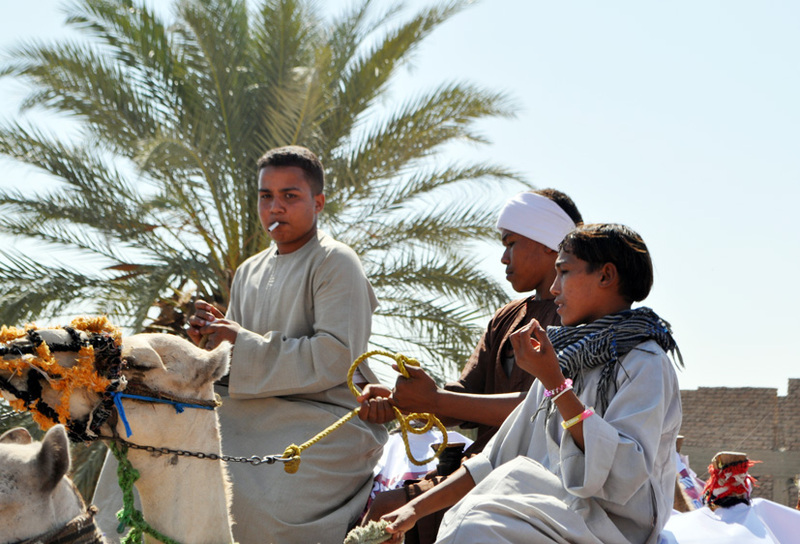 The camels are not raised for races as they are the same camels usually rented for tourists on west bank, some of them looked sick and were handled by children of around 10 years old. 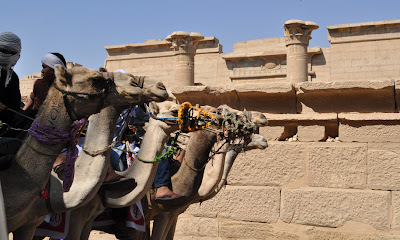 The fact which we noticed during following the “race” that it was not race, it was like picnic started by the colossus of Memnon to Habu temple where they stopped waiting for the rest to come along and rest. 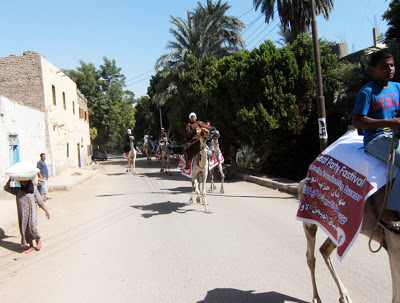 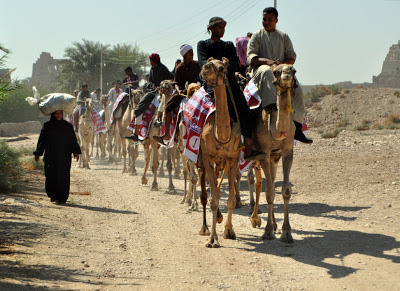 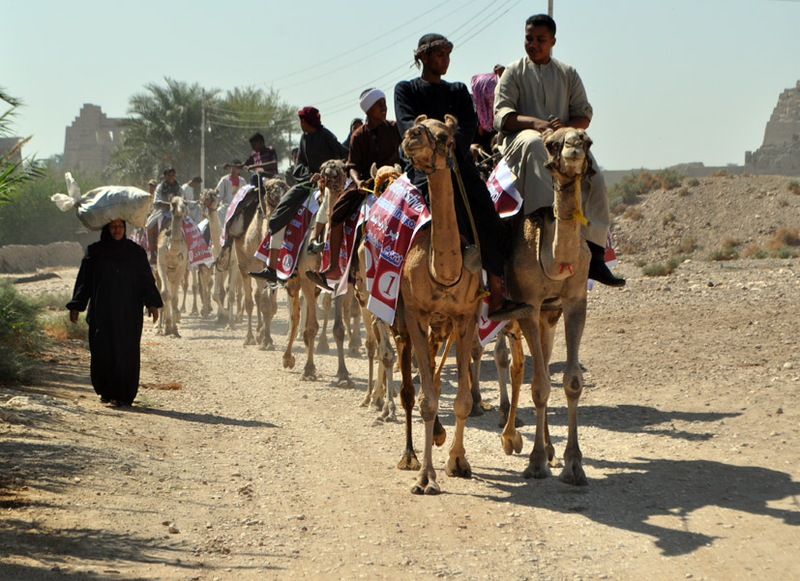 Camel number 14 was leading the race and camel number 1 that kept sitting was in the rare but when the race was resumed from Habu, camel number 1 took the lead most of the way to the finish line which camel number 19 reached first at noon. 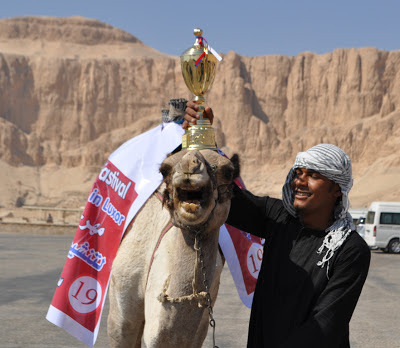 The winner received a trophy from the party’s vice president and the governor who were waiting under the tent that was erected for the guests in the far northern part of the parking space in front of Hatshepsut’s temple. 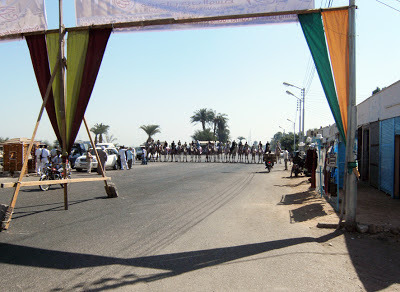 At 4pm boats and caleches parade was planned followed by 5pm conference for the party officials at the conference centre. 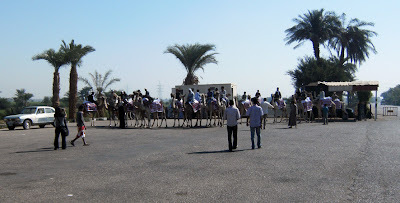 The conference was aimed at the local people; still a written question in English was passed to the podium but was not answered until no foreigners were around and was not an answer at all. 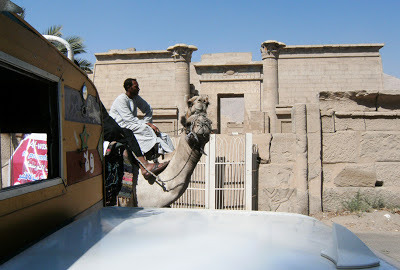 Just another fun day to watch and take pictures but still another sort of “talking amongst ourselves” event to promote tourism to the ex-pats or the tourists in Luxor already. 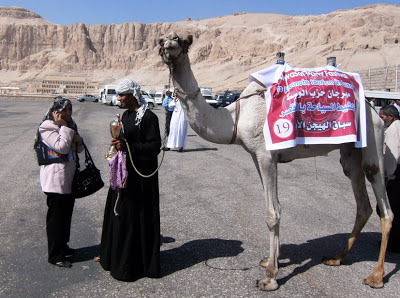 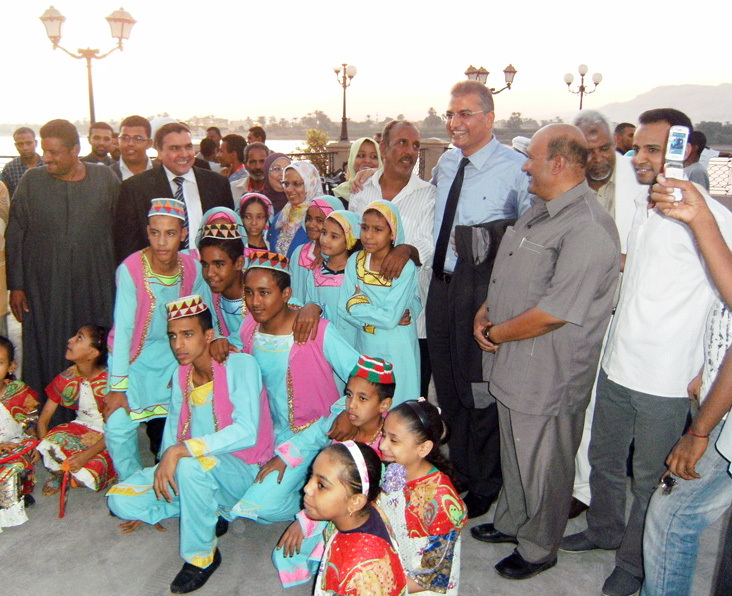 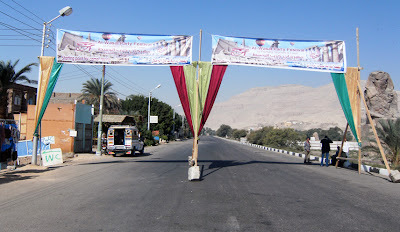 The publicity was professionally handled as the party called for volunteers for the event 12 days before the event and managed to get permission from Ministry State of Antiquities on 2pm the day before the event in addition to the excellent media coverage by all the foreign media representatives of the different newspapers reporters in Luxor for their publications in the Capital of Egypt – Cairo. Luxor’s next tourism promoting event will be on the 4th of November, the former Luxor day for many years until it was changed few years ago.